I’ve come across a number of remarkable libraries over the past month in my usual internet travels – certainly vastly different from our local (but much-loved) library. In particular, three libraries stand out because they represent the old and the new in every sense. And while one isn’t so kid friendly (no book nook with bean bags here), you’ll enjoy the virtual tour. 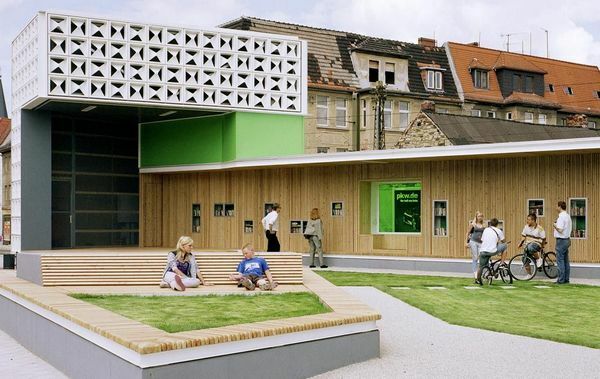 The first is an open-air library in Magdeburg, Germany. 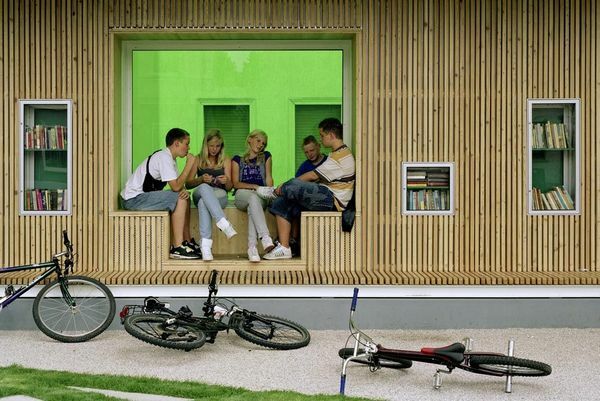 The residents of Salbke, a socially depressed suburb of Magdeburg where public facilities are scarce, organised to collect and share books in an open-air library that they built with prefabricated pieces from a demolished building. More than 20,000 books were donated to the library that is open to the public twenty-four hours a day. The library is managed by the residents themselves who, without any checks or monitoring, freely borrow and return books. A thick wall contains the bookshelves and the site also includes green space where people can read in the open air and a stage where public readings are given, school plays are performed and community concerts are held. 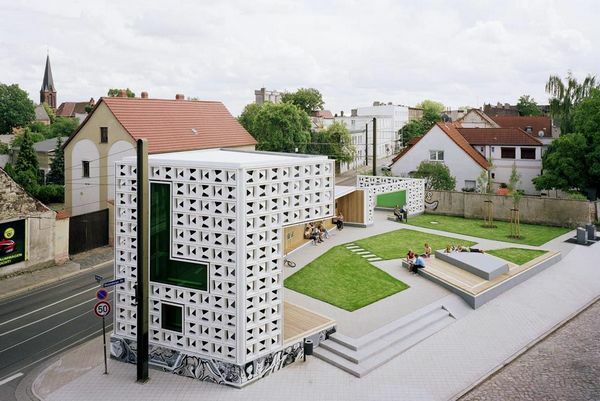 A self-governing community library – such an interesting concept. In contrast to the minimalist library in Salbke, is the Kansas City Central Library in the US. 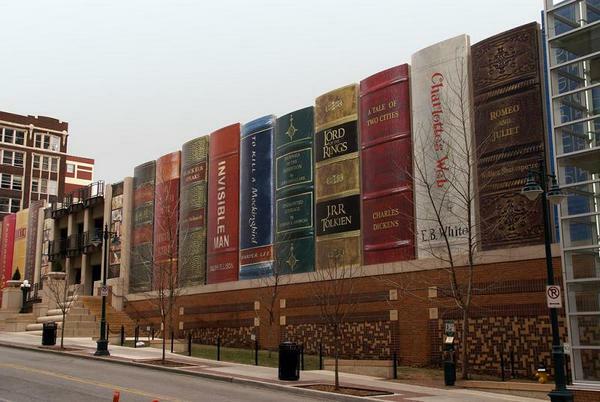 The library is certainly a local landmark – the spines of giant books form the facade of the building, and is known as ‘The Community Bookshelf’. The twenty-two titles included on the ‘Shelf’ were chosen to reflect the range of reading interests as suggested by Kansas City readers. 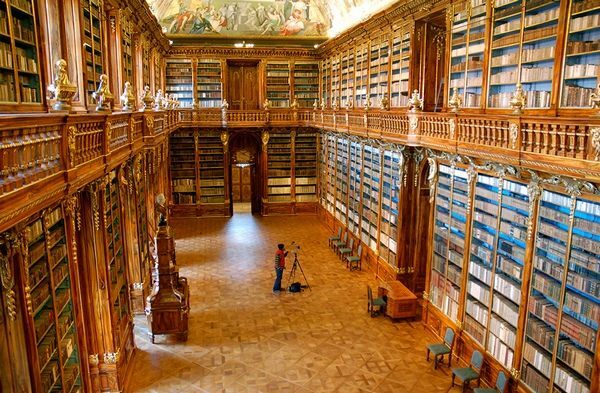 Lastly, marvel at the incredible Philosophical Hall, a Baroque reading room in Prague’s 868-year-old Strahov monastery library. Photographer Jeffrey Martin took thousands of images of the room to create the world’s largest indoor photograph (as at March 2011) – a 40 gigapixel, 360-degree image of the hall that weighs in at 283GB. Thanks to modern technology, library lovers all around the world can use Martin’s photograph to zoom in on every shelf, read the spine of every book and study the ornate architecture in detail – pretty exciting given that this library, filled with rare volumes, is ordinarily off limits to visitors. Be warned, ‘looking’ at this photograph is a sensational time-waster!